Her small hand clenched mine as we wound our way up the hill. When it came time to ride, she chose to sit beside her father. She knew what I knew, that he would always protect her. My son and I sat behind them. We took the first corner, climbed, and then fell downward. I couldn’t tell if she was enjoying the ride or not. All I could see was the back of her head and those small hands, so recently clutching mine, now clutching the safety bar. Doubt about taking her on the ride crept into my mind. Then, I saw it. My husband flashed thumbs up. Next I heard it, her voice whooping with joy. At that moment, I let go. I let go of my worries that she didn’t like it. I let go of my safety bar. As I felt the rush of wind through my outstretched arms, I let go with my own whoop of joy. When my husband pulled out his phone to snap our picture, and I saw it later, I was so pleased to see her smiling face and all our faces crammed into the frame sharing a moment of joy and exhilaration. When the ride was over, we weren’t done. We raced back in line, this time both kids leading the way, stopping and waving at me and my husband to hurry up. We went again. And again. 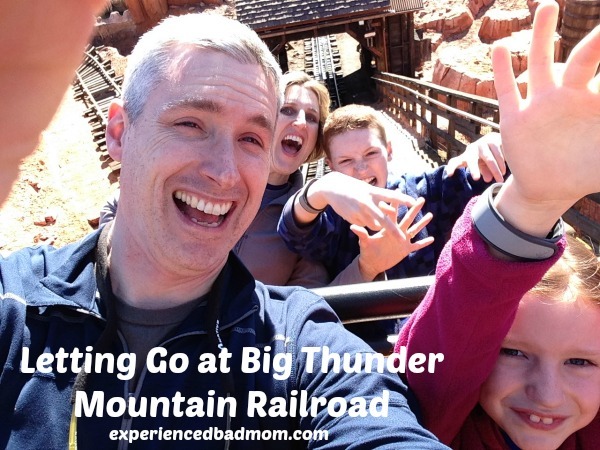 In total, over three days at Disney World, we rode Big Thunder Mountain Railroad nine times. She liked it after all. And I loved it, too. This post was inspired by our family’s trip to DisneyWorld this winter. Have you been? What is your favorite ride? Thanks, Justin! Yup, we pretty much had to use all our positive voices to convince her to try it…and she really loved it and even months later won’t stop talking about it. Maybe your 7yo can be bribed with one of those $20 balloons with a Mickey head inside a bigger clear balloon?! My kids have always wanted one of those but since we can’t take it home my husband and I have always said no. But you can fit it in your car! Yahoooooo! Look at that smile – I love it. And you got to ride Big Thunder for another eight times? Pure Magic. It’s so fun when pushing my cautious 5 yo to take a risk pans out and opens his world to exciting new experiences. But he’s really intense and sometimes even the positive ones come with some emotional overload later! He gets it from me, so I try to stay calm and help him process. Not sure if we’ll manage a major theme park while he’s little. The county fair is a pretty big rush for us. Rachel Rogel recently posted…Beautiful Bodies are Everywhere! It is fun to push them a bit – especially when it pans out. Your country fair comment made me laugh as it reminded me that my kids dragged me on all our fair rides last summer and *I* was the big baby on those, not them! So magical! I want to go to Disney after reading your post!! My Little Dude asks every day! Thanks for sharing on Whatever Wednesday on Thank You Honey! Ah, Disneyland. We went in April, and I’m ready to go back. My kids are nuts! They’ll go on any ride. The scarier the better! Mine are those crazy daredevils that stood on their toes to try to get on the giant roller coasters at Six Flags when they were too short. I don’t even like the log ride! I do love Big Thunder Mountain, though! Great picture of your family! Your hub is more of a daredevil with his phone than I am. I would have been sure I’d drop it if I tried that! What a wonderful adventure to share! It is so hard as a Mom knowing when your child will be okay with something. We love going to Disney. I think our favorite as of right now is the Peter Pan ride. thedoseofreality recently posted…Would You Rather: Summer Sandal Or Summer Hat? Wonderful post! It is so much fun to see our kids branch out of their comfort zones. Sounds like an amazing time! Thank you for sharing on #smallvictoriessundaylinky! Pinned to the Small Victories Sunday Weekly Linky. Hope you join in next week! Awww, what fun! So glad you all loved it so much!